There’s no doubt that Cancun Mexico is known for its incredible white sand beaches and beautiful water, but there are more things to do in Cancun than spending a day at the beach. This beautiful destination is one of the best places to visit in Mexico! Millions of tourists flock to this coastal area each year to soak up the sun, catch some waves and feel the sand between their toes and I’d be lying if I said that wasn’t my intention on my first trip to Cancun. Heading to the beach and just taking a day to relax will be one of the many activities in Cancun that you will enjoy, but it doesn’t have to be the only one. Cancun is an area that is biodiverse and extremely rich in culture and history. With mystical ruins that take you back in time and modern adventurous activities that get your adrenaline pumping, there truly is something for everyone. Cancun is a major tourist destination, especially for people who live in Canada or the United States. It’s an easy place for them to fly to and is relatively cheap depending on what you’re doing (a lot of tours can be on the pricey side, however). For the most part, people flock to Cancun during the winter months as an escape from the snow, making Cancun’s high season between December and April. It’s a good idea to book your accommodation and some of the activities on this list ahead of time to ensure you get a spot. Booking online ahead of time can save you money too, as companies offer discounted rates when you pre-book. Cancun isn’t just a winter getaway destination, and these 21 things to do in Cancun prove just that! Cancun and the surrounding area is really well-known for its hidden underwear world. 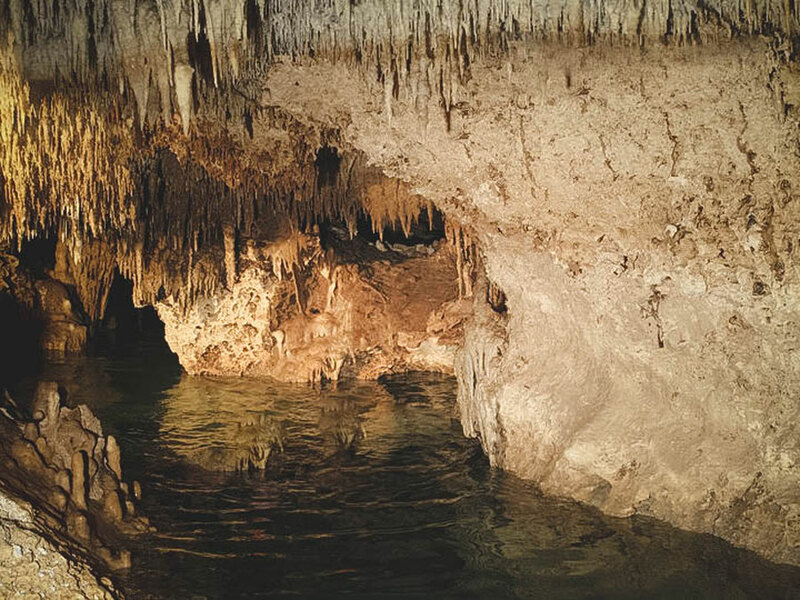 In fact, the underground rivers that flow in the Yucatan Peninsula are the longest network of underground rivers and caves in the world. There are a few places near Cancun where you can enjoy this network of crystal clear water, the most popular place being Xcaret (which is home to a plethora of unique activities). Entry to the park isn’t exceptionally cheap and can run you around $2,000MXN ($100USD) at the doors but if you pre-purchase it’s $1,800MXN ($90USD). Don’t let the price discourage you from going, there are plenty of things to do in Cancun (some that are on this list) that are located within the park. 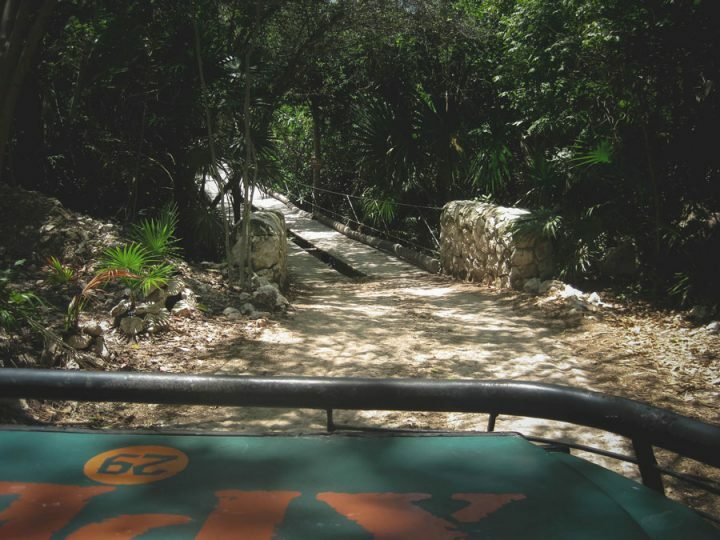 Click here to learn more about Xcaret packages, which include transportation. You can also pay for a package deal with other parks like Xplor (which you’ll read a little bit about in our next point). Swimming in the underground rivers can be done any time of the year as well, making it a great activity year-round, and one of the top things to do in Cancun. Snorkelling is one of the more popular things to do in Cancun (and one of the best things to do in Cabo San Lucas), as it is in many places around the world with beautiful water and reefs. Cancun is home to one of the largest reefs in the world, the Great Mayan Reef. The reef stretches over 1,000 kilometres from the Yucatan Peninsula to Belize and Honduras. One of the best sites for tourists to experience this underwater world is just at the end of Cancun’s hotel zone in an area known as Punta Nizuc. Punta Nizuc is a calm and quiet location that has an array of coral, fish and a few underwear sculptures from Cancun’s underwater museum, MUSA. You have to book a tour to Punta Nizuc (it was open to the public but unfortunately isn’t anymore), the tours include the boat out to sea and rental equipment for around $964MXN ($47USD). Alternatively, if you pay for admission to Xcaret or Xel-Ha there are snorkelling areas in the parks which are also spectacular. Bring an underwater camera to make sure you can capture the action under the sea. Ziplining was not only one of my favourite activities in Cancun, but my parents also raved about it. If you’re looking for more thrilling things to do in Cancun then you absolutely have to go zip lining. Selvatica is an adventure theme park where they offer 4 different zip lines in one package. On their Extreme Canopy tour you’ll soar above the jungle, splash into cenotes, fly like Superman, and experience the rollercoaster of zip lines on their Tarzania Zipline. There are a total of 10 different zip line circuits, so you are guaranteed to have a blast. The Extreme Canopy Tour at Selvatica is $1980MXN ($99USD) for an adult and $980MXN ($49USD) for a child. Click here to learn more and to book this tour. Zip-Lining is also one of the most popular things to do in Puerto Vallarta, if you’re planning a trip to the west coast of Mexico, make sure you check it out! Chichen Itza is arguably one of the largest tourism draws near Cancun and was even named one of the new 7 Wonders of the World. This ancient Mayan site was one of the largest Mayan cities and was a major economic power in the region. On top of it all, Chichen Itza is thought to be one of the great mythical cities of Mesoamerica. 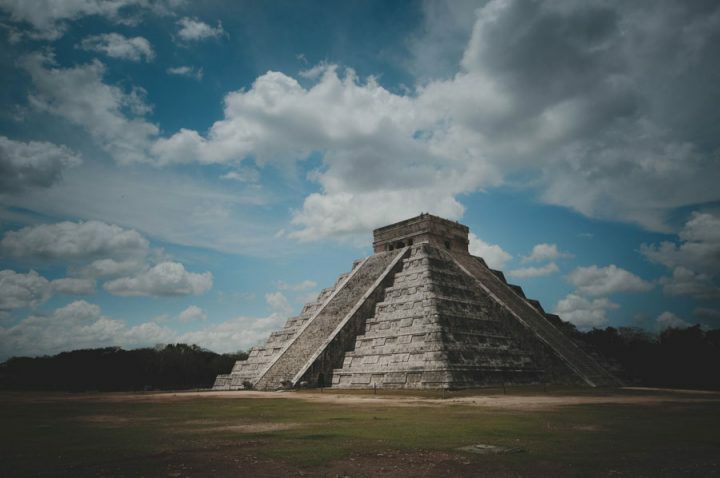 Chichen Itza is home to many ancient buildings that are still in great condition including the Great Ball Court, The Temple of Warriors, El Caracol (an ancient observatory) and the most popular – El Castillo (The Castle). 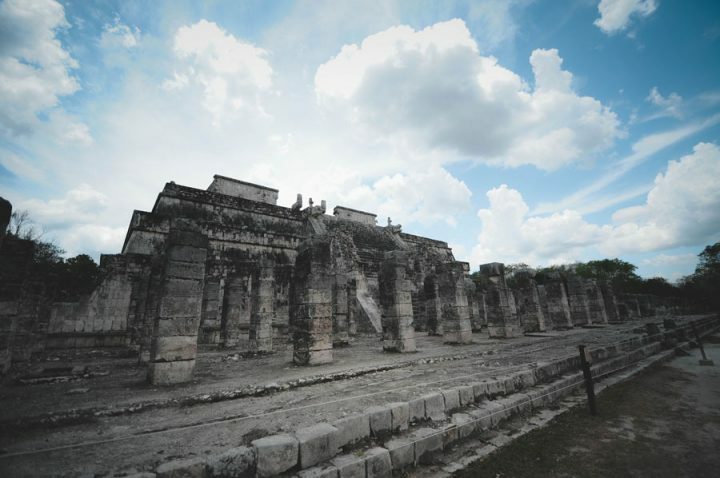 El Castillo is also known as the Temple of Kukulkan. Kukulkan is a snake deity which in Chichen Itza’s case is thought to symbolize divinity in the Yucatan. At the base of the temple are two snake heads which are carved from stone and are a physical representation of Kukulkan. Twice a year on the Spring and Autumn equinoxes the afternoon sun casts an uncanny shadow down the side of the temple, a shadow that replicates the body of a slithering snake. Hundreds of thousands of people visit Chichen Itza each year during this time to see this rare occurrence. It would be a great time to visit if you aren’t afraid of crowds and want a unique experience at Chichen Itza. The temple also holds one more mystery that everyone who visits the site can experience, a mysterious noise. If you clap your hands at the base of El Castillo you’ll hear a very distinct bird-like noise. After years of research, scientists matched this noise with that of the Queztal. The Queztal is an elusive and colourful bird that lives in Central America whose feathers were more valuable to the Mayans than gold. To book a tour to Chichen Itza, click here. If you haven’t quite reached your quota of ancient things to do in Cancun, then you may want to visit Tulum. 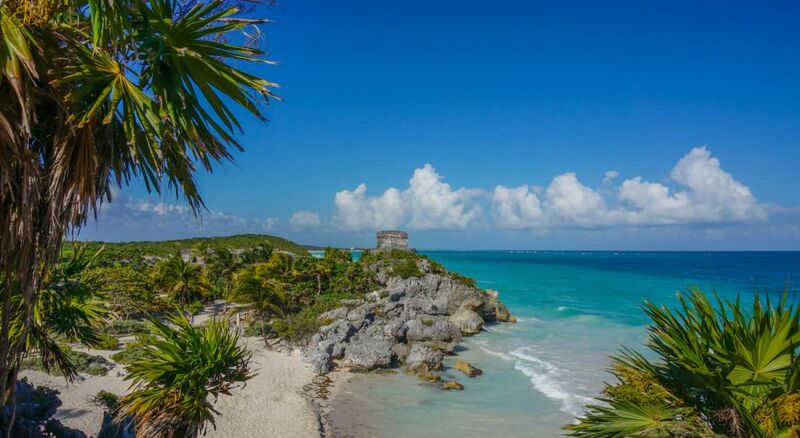 Tulum was once a walled port city that was protected from invasion and continued operating normally for nearly 70 years after the Spanish Conquest. Sitting on the cliff-side overlooking incredible beaches and perfect blue water, Tulum was one of the largest cities built by the Mayans. A trip to Tulum is something you don’t want to miss, it’s also one of the top things to do in Playa del Carmen. Make sure to bring your swimsuit and take a dip in the gorgeous sea. Click here to see tours to Tulum. Downtown is one of the many places in Cancun most tourists seem to skip in exchange for beach visits or other activities. 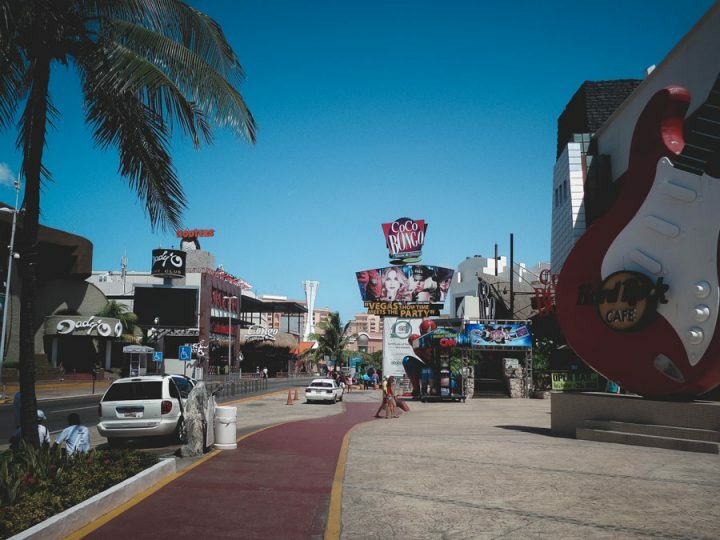 But if you want a more authentic feel of Cancun away from the Hotel Zone (which sometimes feels like the Vegas strip) then you’ll want to head downtown. Downtown is home to a plethora of activities and restaurants offering a look into local life, a trip here is one of the better things to do in Cancun for sure. If you are looking to do a bit of souvenir shopping Mercado 28 (Market 28) is the perfect place. 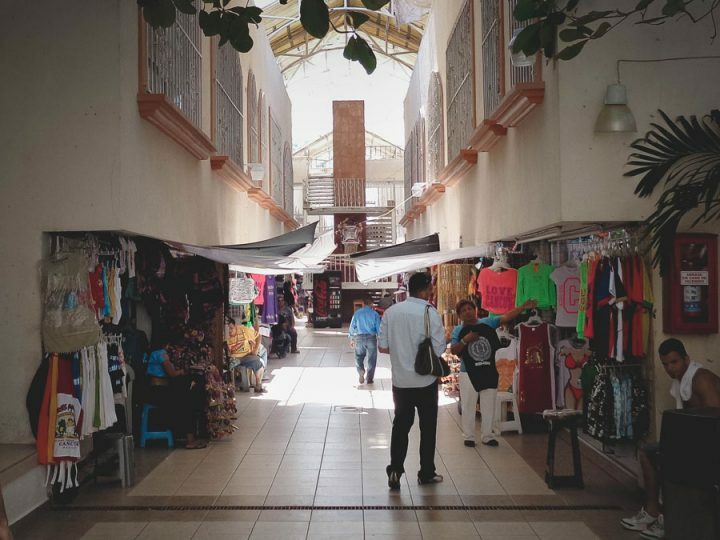 Mercado 28 is a flea-market style shopping area that has an abundance of handmade items, pottery, t-shirts, and souvenirs. Expect to bargain with the shop owners, most of them can be aggressive with their pricing but if you are willing to haggle you might just manage to find yourself a great deal. If you have never been stand-up paddleboarding (SUP), you should definitely consider it when planning your list of things to do in Cancun. Paddleboarding is an easy activity that anyone can do, even if you don’t feel like you have good balance! If you are worried about paddleboarding for the first time you can book lessons which will cost around $726MXN ($35USD) or you can just rent a board for about $587MXN ($28USD) and head out on your own. There are various rental prices for paddleboards in Cancun, so it’s important to look around and check for good pricing, don’t get caught up in the first one you find. Paddleboarding is a relaxing activity in Cancun that is also a great form of exercise, a true win-win. Forum By The Sea is a large area with tons of shops, restaurants (like the Hard Rock Cafe) and some of Cancun’s most famous nightclubs. Coco Bongo is arguably the most popular destination for people looking to experience a show and disco (dancing, not a 70’s disco). The show at Coco Bongo is nothing short of amazing with flying acrobats, musical tributes and a party atmosphere that you won’t soon forget. Tickets for entry can range anywhere from $730MXN ($26USD) to $4020MXN ($195USD) depending on where you want to sit and whether you just want to attend the party. Click here to learn more about tickets, which include open bar and skip-the-line for faster entrance! Haven’t gotten your shopping fill or want to see more places in Cancun to shop and eat? Forum by the Sea (where Coco Bongo is also located) is where you’ll want to find yourself. The Forum is more of an American style shopping and dining area which features restaurants like Hooters, The Hard Rock Cafe, Häagen-Dazs and multiple shops that sell swimwear, sunglasses, clothing, jewellery, and souvenirs. Most of the time, however, you’ll find better deals on your souvenirs at Mercado 28. Not only is Cancun famous for its underground rivers but it’s also famous for its incredible Cenotes. Cenotes are underground caverns that are formed after limestone caves in leaving a giant hole in the earth. This hole typically leads to a pool that in most cases has beautiful aqua-coloured water. Swimming, snorkelling, walking and scuba diving in cenotes is one of the things to do in Cancun that is enjoyed both by tourists and locals. Ik Kil is one of the most popular cenotes for swimming and is located near Chichen Itza and Valladolid. 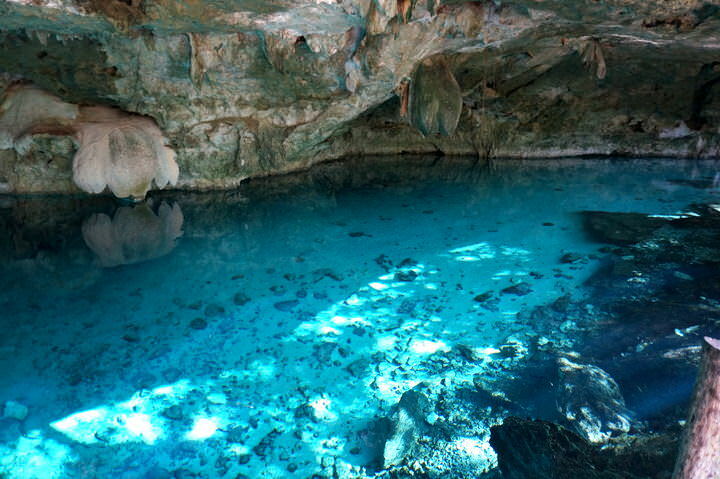 Another popular one is near Valladolid named Cenote Zaci. Looking for a Mexican fiesta? Look no further than Xoximilco, one of the most traditional things to do in Cancun. This Mexican party takes place on board a decorative and colourful Mexican gondola. The gondola takes you through incredible canals that showcase the scenery. The evening continues with delicious Mexican cuisine paired with live music, culture, and traditions. Tickets start at $1800MXN ($90USD) for an adult, but you can purchase them online and save anywhere from 10-15% if you book up to 21 days prior. 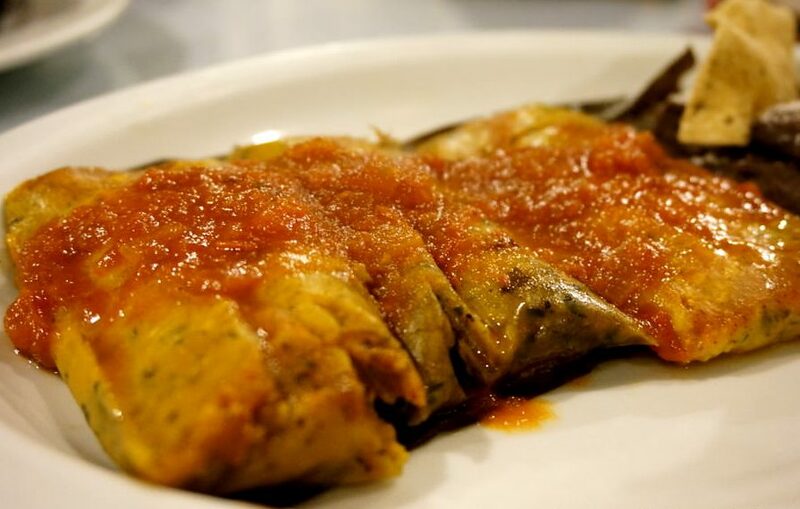 ☞ If you’re planning a trip to other places in Mexico, make sure to check out our travel guide to Manzanillo Colima, 10 awesome things to do in Guanajuato and 15 cool things to do in San Pancho. Mexico is such a diverse destination, backpacking Mexico will be a trip you never forget! A short ferry ride will take you to Isla Mujeres, a small island in the Caribbean Sea that is only 7km long and around 650 metres wide. Isla Mujeres is popular for its incredible beaches, fresh seafood, large sea turtle population and spectacular snorkelling and scuba diving. If you’re looking for a good snorkelling adventure on Isla Mujeres head to the Garrafon National Reef Park. Perhaps you don’t want to snorkel but want to get closer to the local turtles visit the islands turtle sanctuary and rehabilitation centre, Tortugranja. You can also take a glass-bottomed boat ride to see the underwater world without getting wet! Click here to learn about tours from Cancun to Isla Mujeres. Easily accessible by bus (which are safe, friendly and typically quite quick) the Cancun sign is located on the Playa Delfines beach. This is one of the more touristy activities in Cancun but makes for a great photo to bring back home. Behind this bright and colourful sign is an incredible white sand beach with bright blue waters, making it not only a great photo opportunity but also a perfect stop on your list of things to do in Cancun that don’t take an entire afternoon. 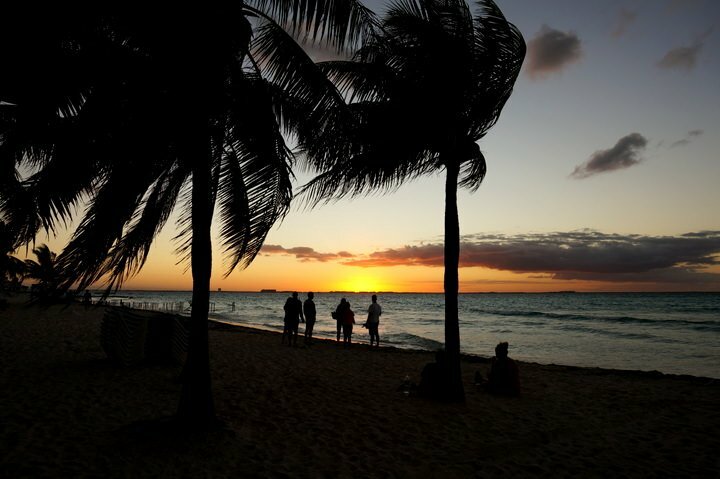 It is also a great place to have a picnic and watch the beautiful Cancun sunset! Of all the places in Cancun and its surrounding region, Valladolid is arguably the most magical and quaint, making it the perfect destination for a day trip. 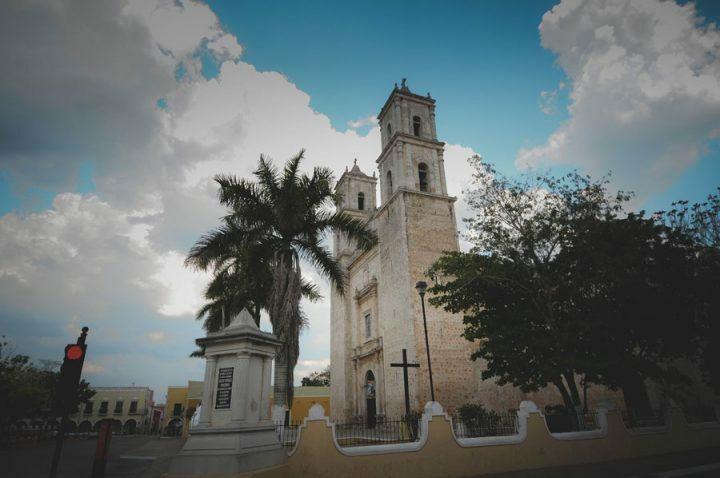 Located about an hour and a half to two hours from Cancun, Valladolid channels its Spanish roots in looks, but also showcases its Yucatan history and culture. Most of the town’s layout consists of large blocks of buildings and houses with lavish, green courtyards in the middle. These beautiful courtyards make amazing places to grab some lunch and view the Spanish inspired architecture. A Temazcal is an ancient Mayan ceremony that is meant to be a source of energy and health. The ceremony takes place in a hut where volcanic rocks are heated and glow in the dark as the hut becomes a sauna. The aroma of herbs surrounds you as you kick back and soak it all in. You will then be taken through various stages of increasing and decreasing heat while you listen to live music. It is without a doubt one of the best places in Cancun to truly sit back and relax. Typically the ceremony concludes with a refreshing dip in a cold bath and light fruit snacks and natural beverages. Prices can vary for these ceremonies but most are in the $2236MXN ($109USD) range and take around 90 minutes. Click here to learn more about this purification ceremony and to book a tour. This is probably one of the things to do in Cancun that you’ve already added to your list. Tequila and tequila tasting is considered an art in Mexico and is something Mexicans take very seriously, so why not enjoy this age- old tradition? The Restaurante La Destileria has a tequila museum that lets visitors learn about the origins of tequila and gives some insight towards the distilling process. And yes, at the end of the tour there is a tequila tasting. Hacienda Sisal is another restaurant that offers an array of tequila and even pairs them with items on their menu for a more unique experience. This will arguably one of the more fun things to do in Cancun that doesn’t take an entire afternoon and fills you up with delicious food. Even my parents who took a vacation to this infamous ‘fun and party filled’ restaurant had a great time. 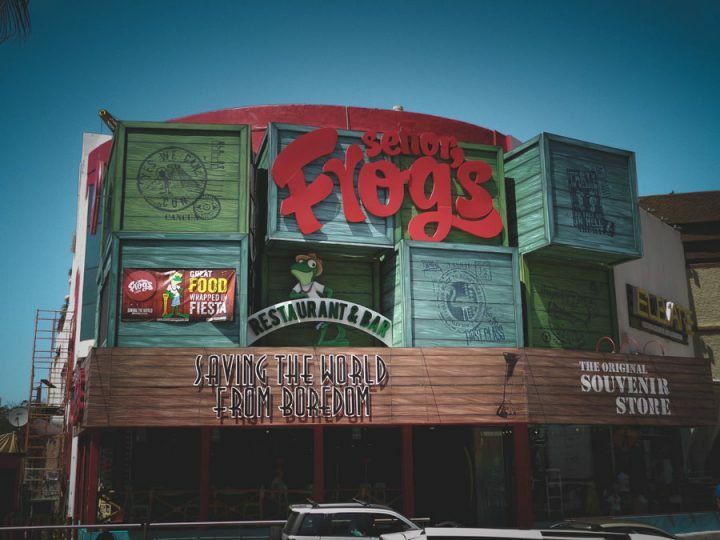 The funky decor and an untraditional restaurant vibe, make Señor Frogs a great place to grab a meal and just enjoy yourself. If you’re really into the party scene or looking for a place to spend a night out, Señor Frogs also hosts events like foam parties, beach parties, and an open bar. As mentioned before, the Cancun hotel zone is very reminiscent of the Vegas strip except for it’s a lot more tropical and arguably even hotter. Bring some sunscreen because this is one of the things to do in Cancun that will get you a ton of sun exposure and the Mexican sun is not forgiving. The hotel zone has amazing views of the ocean, lots of shops (even a little shopping village with bridges and pathways), restaurants, a Mayan museum, a water park, an aquarium, and even iguanas soaking up the sun! Sian Ka’an Biosphere Reserve is located just near Tulum and was declared a UNESCO site in 1987 because of its unique biodiversity and Mayan heritage. 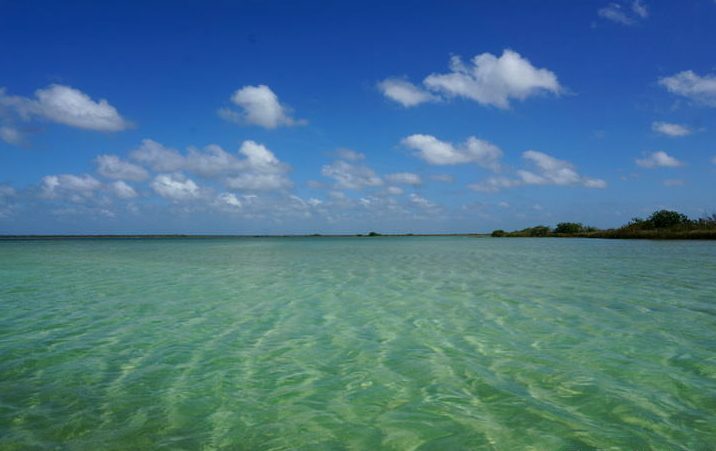 The entire reserve is about 1.3 million acres and is the largest protected area in the Mexican Caribbean. Sian Ka’an is home to nearly 115 species of mammals and over a thousand different species of insects. On top of its extremely unusual and diverse animal population, the reserve has over 1048 species of flora. You can do boat tours that take you through the reserve making it one of the most incredible things to do in Cancun that your friends have probably never even heard of! Plenty of different companies offer ATV activities in Cancun, most of which take you through the jungle – getting you closer to nature while nurturing your thrill-seeking ways. Xplor is a great place to go ATVing and their ATV track is included with their park entry pricing. Click here to learn more about the Xplor day pass. Whether you plan on visiting Cancun alone, with your spouse, your friends, or your family, you will find something unique and fun to do. My parents had a blast in Cancun and they’ve been retired for a few years now. When I told them about this post all they could talk about was all the incredible things they did and my inbox became flooded with pictures from their trip. I hope this post showcases how unique Cancun truly is and breaks the typical stereotype that it’s just a beach destination. Just because travellers typically go to somewhere for the beaches doesn’t mean that’s all there is to see and do there. Plan a vacation to Cancun to include some of the things on my list, and you’ll have a holiday you won’t soon forget! There are a lot of adventure activities in this city! Make sure you’re protected with a good travel insurance policy. We use and recommend WorldNomads for travel insurance. This is a great place to rent a car! We always book with Expedia because they allow you to cancel for free on most bookings and you’re never charged until you actually pick up your ride. Do your part for the environment while you’re travelling! Check out cool eco-friendly travel products on Amazon like metal straws. The post 21 Things To Do in Cancun That Aren’t The Beach appeared first on Goats On The Road.